Eating organic, local produce isn’t just for foodies anymore. However, buying organic is still significantly more expensive. So, when is it most important to buy organic and when can you skimp and save a little? Scientists did a recent test seeing which produce had the most pesticide residue on it, and came up with 12 “worst offenders.” The study also identified the produce that had the least amount of pesticide residue. 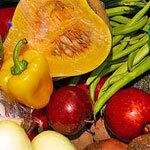 All in all, it is more benefcial to buy fruits and vegeatables whether they are organic or not. Yet, next time you go shopping it might be worth it to spend a little more on that organic apple.